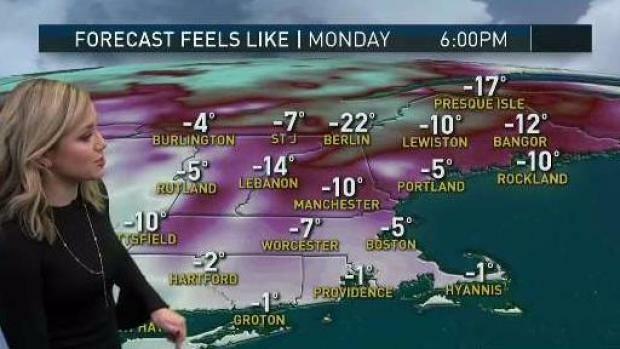 Tonight: Bitterly cold. -5 to 5. Tomorrow: Mostly sunny and cold. Upper 10s. Wednesday: Mostly sunny. Bit “milder”. Upper 20s. So far 2018 is picking up right where 2017 left off: in the freezer. 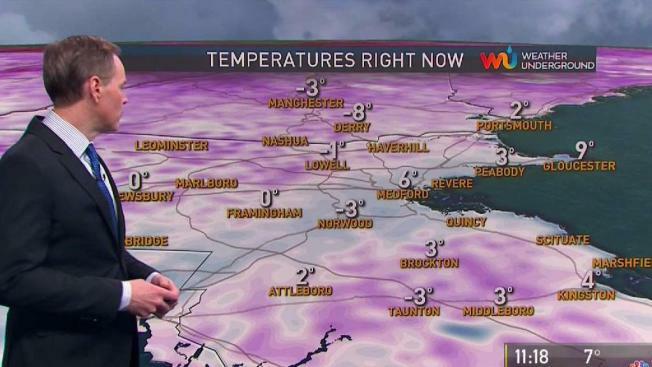 Portland, Maine welcomed the new year with a record low of -16. In Boston, temperatures dropped to 0 after finishing December 4 degrees below average, and after enduring the coldest New Year’s Eve midnight temperature since First Night celebrations began in 1975. That arctic chill sticks around on New Year’s Day with highs only reaching the single digits and teens. A gusty northwest wind will continue to make it feel well below zero most of the day, despite widespread sunshine except for on parts of the Cape where ocean effect clouds and snow showers linger for a time. Tuesday brings more of the same. A morning with temperatures on either side of zero, with afternoon highs in the teens for most. A few spots will approach 20 near and south of Boston by afternoon. Monday: Cold, bright, breezy. Highs in the single digits and teens. Monday Night: Mostly clear. Lows in the single digits. Tuesday: Bright, cold. Highs in the teens. Keep in mind that Tuesday morning will be one of the first brutally cold days where students are waiting at the bus stop since most of this cold snap has corresponded with vacation. Some busses may actually have a hard time starting, so be prepared for some cold-related delays. Temperatures pop into the 20s on Wednesday as our wind goes around to the south. That’s still well below average, but it will actually feel nice. All eyes then turn to the Atlantic on Thursday as a powerful storm gathers strength. For now, it appears as though the core of the storm will remain offshore, but it will be so sprawling that even here in New England we’ll see snow and gusty winds. The extent of the snow and wind will be determined by the exact storm track. On the current track, many would see a few inches, with gusts 40-50+ mph at the coast. If the storm tracks farther west, inland snow would be heavier while some rain would mix in at the coast. There would also be more wind. A track farther east would bring mostly snow for everyone, but it would be of lighter intensity with less wind. Tides are astronomically high on Thursday around midday due to the full moon this week, so there may be some minor coastal flooding. Regardless of the exact track, another shot of vicious cold will return Friday into parts of the weekend. Next week finally brings the return of some 30s, along with more rain and snow showers.